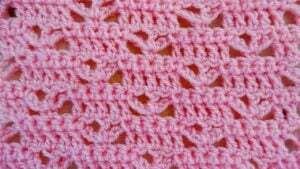 Learn how to crochet this gorgeous stitch pattern by following along with the written pattern and photo tutorial. Or, if you’re into videos, you’ll enjoy either the left or right-handed version. As, for the stitch pattern, it’s perfect for crocheting just about anything you like. To make it as shown you will need a worsted weight yarn and an H crochet hook.